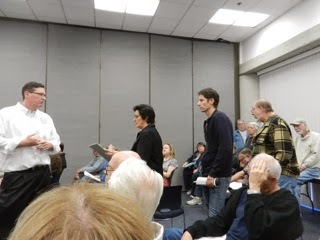 The Costa Mesa Sanitary District held the second of what now may turn out to be a series of workshops for ratepayers on the proposal being considered by the Board of Directors to make a change in the way we - and their hauler, CR&R Environmental Services - handle our waste. 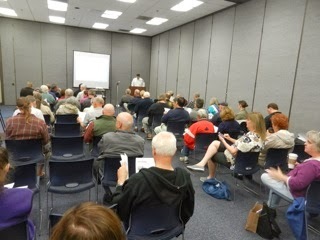 As was the case with the first one, which I reported HERE, there was a good turnout of interested folks. In fact, as you can see from the accompanying photos, it was standing room only at the Neighborhood Community Center Saturday morning. 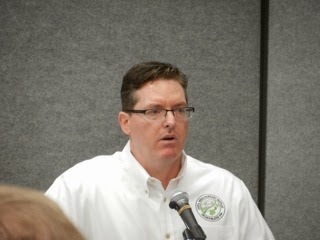 This time around Scott Carroll, General Manager of the Sanitary District, flipped the agenda. After an introduction, Mike Silva from CR&R Environmental Services spoke first, providing a detailed overview of the process being proposed. That slide show can be viewed HERE. Then Carroll took over and gave the Sanitary District perspective, including how we might be required/requested to change the way we handle our household waste. 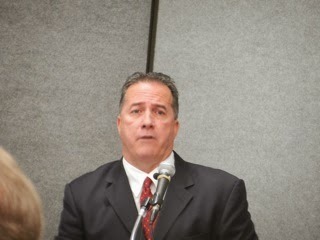 He also addressed the costs associated with this change, projected at $1.81 per household per month. The overall cost mentioned to the Sanitary District slightly exceeded $500,000 per year. You can view the slide show he used HERE. This time around all questions were held to the end, which made for much more understandable presentations and better questions. In a nutshell, instead of simply dumping all our household waste - green waste, recyclables, food waste and just plain old trash - into the same container (carts), we would be asked to place the green waste and other "organics", like food waste, grease, certain plastics, etc., into a specific cart and everything else in one of those we presently use. Each household would be permitted to have two each without additional charge. This all comes about because of legislation that requires greater diversion of our trash from landfills - we're just flat running out of space. It seems not so much of IF we have to make this kind of change, but WHEN. 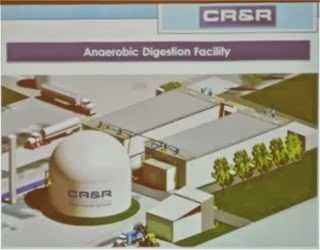 Silva told us they've asked the CMSD to be the first to use their new Anaerobic Digestion System, located in Perris, California, and that we would be guaranteed the lowest rate of any city participating as this process signs up more municipalities. It will add, under the current proposal, roughly $20.00 per ton to the cost of processing the "organic" waste. Organic waste represents approximately one third of the total waste, so the increase does not go up for the other waste materials. 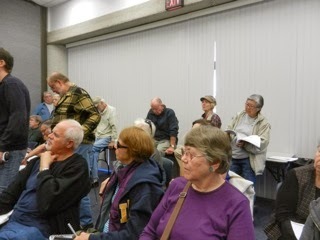 Carroll, impressed with the second large turnout, indicated that there may be more such meetings to further take the pulse of the community on this issue. The Board is scheduled to meet on January 23rd to discuss this issue, but he implied that they may not vote on it until more meetings are held. He also indicated that the meeting in two weeks MIGHT take place at the Neighborhood Community Center instead in the cramped facilities at CMSD Headquarters on 19th Street. More than thirty speakers stepped to the microphone and asked questions important to them and others in the audience of approximately 75 people. They included concerns about how we physically handle the food waste, how already crowded streets near multi-family units will manage more cans on trash day, increasing the number of trucks on the streets, etc. I'm not going to list them all. Scott Poetter, field representative for lame-duck Assemblyman Allan Mansoor, stepped to the microphone to ask politically-charged, snarky questions of Carroll about Newport Beach rates and other irrelevancies. 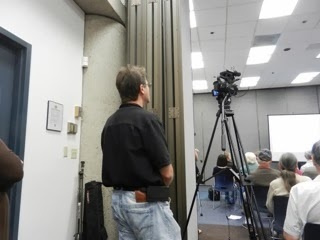 Barry Friedland, who provides Costa Mesa-oriented video clips on his Costa Mesa Brief YouTube channel, HERE, was there to tape the meeting. I presume, although I'm not sure, that it will be available for viewing at that site within a week. I guess now we just have to wait to see if more of these meetings will be scheduled, and when. And, of course, we'll look forward to any word from the Board about their decision on this efficient, but costly, change. This new requirement will have unintended consequences, such as more organic waste going into the sewage system. It would be better to reduce the amount of solid waste by restricting the bulk of packaging, junk mail and advertising we receive. I have no place in my kitchen for another waste container. I try to limit the amount of organic waste I put into the garbage disposal in order not to burden the sewage system unnecessarily. But I surely am not going to go outside to the big trash cart every time I core an apple or crack an egg. This new requirement will not reduce solid waste. It will just shift organic waste from landfills to the sewage system. In most cities that have been sorting trash for years, the green bin is used for lawn clippings, leaves, and other "yard waste." This system works pretty well as long as people don't put other trash into the green bin. On the san. district's website it says that kitchen scraps can still be thrown in the mixed waste trash container, so there's no need to dump anything down your drain and clog up your plumbing. Have fun needing to replace your disposal twice as often as the rest of us. it doesnt work perfectly, but i would say mine is at least 80% reduced. really? No space for one small baggie you take out on your way out of the house daily? and if you are that horrendously inconvenienced (heaven forbid), surely you could just do as casual viewer suggests, just put it in with the rest of the non recyclables! I wish people would look at changes like these being made as the positive act they are that will benefit ALL of us, rather than moan about a very minor inconvenience. First world problems! We started composting awhile back, and we have reduced our kitchen waste by half easily. Now we take the cans and bottles to recycle ourselves every few weeks and get a nice little $$ back at the market. We don't even fill up one trash container anymore. I'm very happy to be recycling.